Korçë ([kɔɾtʃə]; (definite Albanian form: Korça, other names see below) is a city and municipality in southeastern Albania, and the seat of Korçë County. It was formed at the 2015 local government reform by the merger of the former municipalities Drenovë, Korçë, Lekas, Mollaj, Qendër Bulgarec, Vithkuq, Voskop and Voskopojë, that became municipal units. The seat of the municipality is the city Korçë. The total population is 75,994 (2011 census), in a total area of 805.99 km2 (311.19 sq mi). The population of the former municipality at the 2011 census was 51,152. It is the sixth largest city in Albania. It stands on a plateau some 850 m (2,789 ft) above sea level, surrounded by the Morava Mountains. Korçë is named differently in other languages: Aromanian: Curceaua or Corceao; Bulgarian Горица, Goritsa; Greek: Κορυτσά, Korytsá; Italian: Coriza; Turkish: Görice; Romanian: Korça. The current name is of Slavic origin. The word "Gorica" means "hill" in Old Church Slavonic, and is a very common toponym in Albania and Slavic countries (eg. 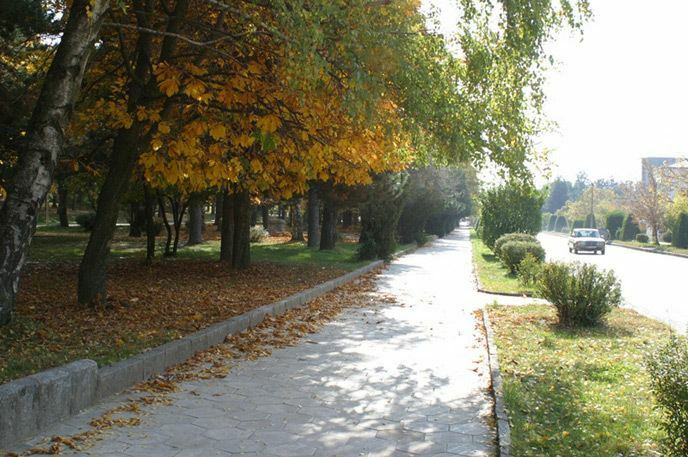 Podgorica, Pogradec). The Copper Age lasted from 3000 BC to 2100 BC. Mycenean pottery was introduced in the plain of Korçë during the late Bronze Age (Late Helladic IIIc), and has been claimed that the tribes living in this region before the Dark Age migrations, probably spoke a northwestern Greek dialect. The area was on the border between Illyria and Epirus and according to a historical reconstruction was ruled by an Illyrian dynasty until 650 BC, while after 650 BC a Chaonian dynasty. During this period the area was inhabited by Greek tribes of the northwestern (Epirote) group, possibly Chaonians or Molossians, which were two of the three major Epirote tribes inhabiting the region of Epirus. Archaeologists have found a gravestone of the 2nd or 3rd century AD depicting two Illyrian blacksmiths working iron on an anvil near modern Korçë. From the 13th century it was a small settlement called Episkopi (Greek: Επισκοπή, "bishopric"). The modern town dates from the 1480s, when Iljaz Hoxha, during the reign of Ottoman Sultan Bayezid II, developed Korçë. The Ottoman occupation began in 1440, and after Hoxha's role in the siege of Constantinople, in 1453; he was awarded the title, 'Iljaz Bey Mirahor'. Korçë was a sandjak of the Manastir Vilayet in the Ottoman Empire as Görice. The city started to flourish when the nearby town of Moscopole was raided by the Albanian troops of Ali Pasha at 1788. In the late 1880s Gjerasim Qiriazi began his Protestant mission in the city. He and fellow members of the Kyrias family established Albanian speaking institutions in Korçë, with his sister Sevasti Qiriazi founding the first Albanian girls school in 1891. Ottoman rule over Korçë lasted until 1912; although the city and its surroundings were supposed to become part of the Principality of Bulgaria according to the Treaty of San Stefano in 1878, the Treaty of Berlin of the same year returned the area to Ottoman rule. In 1910 the Orthodox Alliance of Korçë led by Mihal Grameno proclaimed the establishment of an Albanian church, but the Ottoman authorities refused to recognize it. Korçë's proximity to Greece, which claimed the entire Orthodox population as Greek, led to its being fiercely contested in the Balkan Wars of 1912–1913. Greek forces captured Korçë from the Ottomans on 6 December 1912 and afterwards proceeded to imprison the Albanian nationalists of the town. Its incorporation into Albania in 1913 was disputed by Greece, who claimed it as part of a region called 'Northern Epirus', and resulted in a rebellion by the local Greek population that asked the intervention of the Greek army. This rebellion was initially suppressed by the Dutch commanders of the Albanian gendarmerie, that consisted of 100 Albanians led by Themistokli Gërmenji, as a result the local Greek-Orthodox bishop Germanos and other members of the town council were arrested and expelled by the Dutch. However, under the terms of the Protocol of Corfu (May 1914), the city became part of the Autonomous Republic of Northern Epirus inside the borders of the principality of Albania, while on 10 July 1914 the Greek Northern Epirote forces took over the city. In October 1914 the city came again under Greek administration. During the period of the National Schism (1916) a local revolt broke out and with military and local support Korçë came under the control of Eleftherios Venizelos' Movement of National Defence, overthrowing the royalist forces. However, due to developments in the Macedonian Front of World War I the city came soon under French control (1916–1920). During this time fourteen representatives of Korçë and Colonel Descoins signed a protocol that proclaimed the Autonomous Albanian Republic of Korçë under the military protection of the French army and with Themistokli Gërmenji as president. It ultimately remained part of Albania, as determined by the International Boundary Commission, which affirmed the country's 1913 borders. The period of the People's Socialist Republic of Albania was a difficult time in the region. President Enver Hoxha targeted the rich, despite the fact that they had fought for the creation of the communist state by fighting against the Fascist occupations. Right after World War II many people fled to Boston, United States joining a community of the Albanian-Americans, who had previously emigrated there. After 1990 Korçë was one of the six cities where the New Democratic Party won all the constituencies. Popular revolts in February 1991 ended with the tearing down of Hoxha's statue. After the fall of communism, the city fell into disregard in many aspects. However following the 2000s, the city experienced a makeover as main streets and alleys started to be reconstructed, locals began to renovate their historic villas, a calendar of events was introduced, building façades painted, and city parks reinvigorated. The European Union is financing the renovation of the Korca Old Bazaar while the city centre was redesigned, and a watch tower constructed. Korçë has a transitional Mediterranean climate (or continental Mediterranean climate) with high temperature amplitudes. The hottest month is August (25 °C (77 °F)) while January (2 °C (36 °F)) is the coldest. 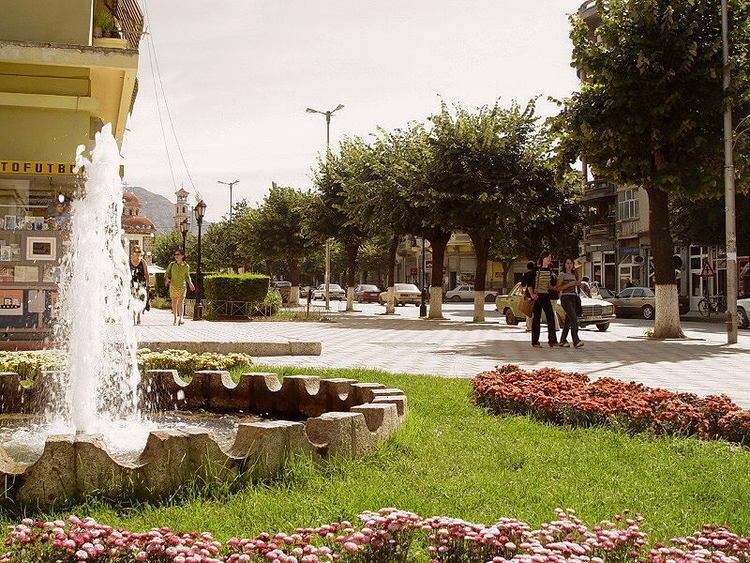 The city receives around 710 millimeters (28 in) annual precipitation with summer minimum and winter maximum, which makes it easily the driest major city in generally humid Albania, owing to the rain shadow of the coastal mountains. The temperatures in Korçë generally remain cooler than the western part of Albania, due to the middle altitude of the plain in which it is situated, but it receives about 2300 hours of solar radiation per year, so its temperatures are higher than those in Northeastern Albania. Temperatures can still reach up to 40 °C (104 °F) or higher on occasions. Korçë is the 7th populous city in Albania and the largest city in the Korçë County. In 2007, the population of the city was about 86.176 inhabitants. According to the Institute of Statistics (INSTAT), the city of Korçë include 51.683 (25.478 male; 26.205 female) people as of the 2011 Census. For centuries Korçë has been an important religious centre for Orthodox Christians and Muslims. 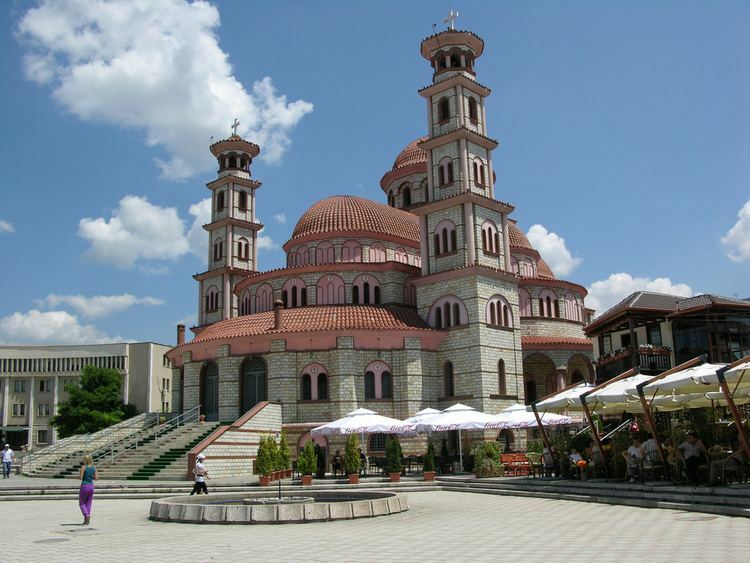 The city is host to a large Orthodox community. There is also a large Sunni community in and around the city. A Bektashi community is also present in the city. The main centre of the Bektashis of the area is the Turan Tekke. The city was initially part of the Metropolis of Kastoria (15th century), but in the early 17th century became the seat of an Orthodox bishop and in 1670 was elevated to metropolitan bishopric. The city remained entirely Christian until the first half of the 16th century. The Orthodox cathedral of saint George, a significant landmark in the city, was demolished by the authorities of the People's Republic of Albania during the atheistic campaign. Islam entered the city in the 15th century through Iljaz Hoxha, an Albanian jannissary, who actively participated in the Fall of Constantinople. One of the oldest mosques in Albania was built by Iljaz Hoxha in 1484, the Iliaz Mirahori Mosque. The first school, a Greek language school, in the city was established in 1724 with the support of residents of nearby Vithkuq. This school was destroyed during the Greek War of Independence but it reopened in 1830. In 1857 a Greek school for girls was operating in the city. During the 19th century various local benefactors such as Ioannis Pangas donated money for the promotion of Greek education and culture in Korçë, such as the Bangas Gymnasium. Similarly, kindergartens, boarding and urban schools, were also operating in the city during this period. Under these developments, a special community fund, named the Lasso fund, was established in 1850 by the local Orthodox bishop Neophytos, in order to support Greek cultural activity in Korçë. At the end of the 19th century local Albanians expressed a growing need to be educated in their native language. The Albanian intellectual diaspora from Istanbul and Bucharest initially tried to avoid antagonism towards the notables of Korçë, who were in favor of Greek culture. Thus they suggested the introduction of Albanian language in the existing Greek Orthodox schools, a proposal which was discussed with the local bishop and the city council; the Demogeronteia (Greek: Δημογεροντεία) and finally rejected by the Ecumenical Patriarchate of Constantinople. As a result, the first Albanian language school was established in 1887 by the Drita (English: Light) organization and funded by notable local individuals. Its first director was Pandeli Sotiri. Naim Frashëri, the national poet of Albania played a great role in the opening of the school. As a high-ranking statesman in the ministry of education of the Ottoman Empire he managed to get official permission for the school. The Ottoman authorities gave permission only for Christian children to be educated in Albanian, but the Albanians did not follow this restriction and allowed also Muslim children to attend. As a result, the school was closed in 1902 by the Ottoman authorities. When the city was under French administration in 1916 (the Republic of Korçë), Greek schools were closed and 200 Albanian and French language schools were opened. A few months later Greek schools were reopened as a reward and result of Greece's adhesion to the Entente alliance, part of which was France. Particularly relevant was the opening in 1917 of the Albanian National Lyceum. Korçë is host to academic institutions such as the Fan Noli University, Albanian National Lyceum and the Bangas Gymnasium. Korçë is referred to as the city of museums. The city hosts two major museums such as the National Museum of Medieval Art and National Museum of Archeology. The National Museum of Medieval Art has rich archives of about 7000 icons and 500 other objects in textile, stone and metal. The first Albanian School as well as the residence and gallery of painter Vangjush Mio function as museums. The Bratko Museum and the Oriental Museum are also located in the city. One of Korçë's most popular sport is football. Its most popular soccer club is Skënderbeu Korçë and was formed on 15 April 1909 under the name Vllazëria by politician and poet Hilë Mosi. They are Albanian Champions in 1933 and recently, in 2011, 2012, 2013, 2014, 2015 and 2016. In 2015 the club became the first Albanian side to reach the play-off round of the UEFA Champions League but they lost to Dinamo Zagreb and dropped into the UEFA Europa League, and became the first Albanian club to qualify for the group stage of European competition.